From intensively landscaped formal gardens to vast areas of open green space, Nashville’s Centennial Park is a classic example of what an urban park can be. Located a couple of miles from the heart of downtown, the park occupies more than 130 acres of land just across the street (West End Ave.) from Vanderbilt University. 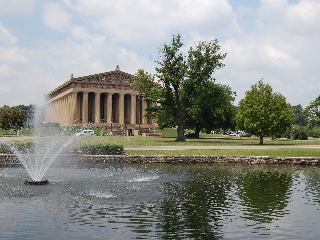 Centennial Park came into being in 1897 as the site of The Tennessee Centennial and International Exposition. A full-size replica of the Parthenon was temporarily constructed for display as part of the Exposition. After the closing of the Exposition, the temporary Parthenon was dismantled and a permanent structure of concrete was built in honor of Nashville’s designation as the “Athens Of The South.” This structure remains today as the architectural focal point of the park. A small lake was also created as part of the Centennial Exposition. Lake Watauga is now home to many waterfowl and the site of one of the park’s most popular family activities—bringing the kids out to feed the ducks. A paved walking trail that surrounds the lake and extends into other areas of the park serves as a jogging, biking, and roller-blading surface for countless daily visitors. Adjacent to the walking trails and in other areas on the grounds surrounding the lake, many concentrated gardens of seasonal flowering plants are intensively maintained. A sunken formal garden is a popular site for weddings as is the rose garden. An unusual horticultural aspect of the park is the fact that more than 100 species of trees exist within the bounds of this urban site. A well-placed map near the walking trail lists the identities and locations of many of these trees and offers a great lesson in the extensive variety of species to be found within a typical southern hardwood forest. The Centennial Park bandshell serves an often-used location for performances by a variety of musical artists including the Nashville Symphony Orchestra. This area is also the setting for seasonal performances of the Shakespeare in the Park series and for weekly screenings of family movies. On Saturday evenings throughout the summer, another large shelter in the park hosts free big band concerts and dances. This well-attended series has been going on for more than a quarter of a century. Many acres of well-maintained grassy areas are open to Frisbee tossers and football flingers of all ages. These same expansive grounds host periodic craft and artisan fairs, drawing vendors and attendees from various parts of the country. Picnic tables are scattered beneath huge shade trees throughout Centennial Park, or just select your own site and spread a blanket on the ground. 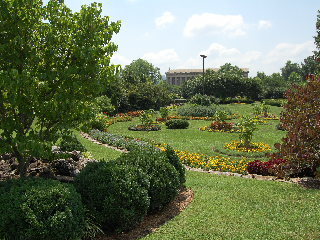 Nashville’s Centennial Park is a friendly and popular outdoor gathering place for its citizens and a favorite horticultural and historical site appealing to the city’s visitors.